Rudy and Elsa Bowman started their tiny living adventure in August 2018. Primrose was the name they gave their new “baby” on wheels. 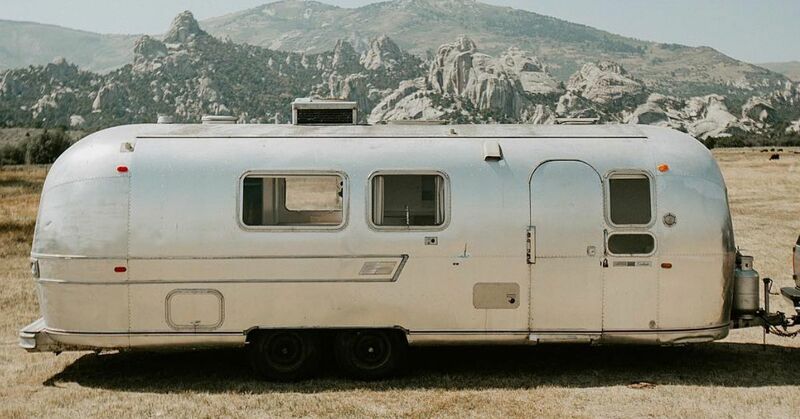 Measuring 200 square feet, they meant the 1969 Airstream to be their seasonal home. Airstream is an American brand of travel trailers. They stand out from all the rest because of their distinct rounded body as well as their polished aluminum exterior. As stated in the website, each Airstream is handcrafted in Jackson Center, Ohio. When they were decorating the interiors of Primrose, the couple made sure to stay true to the spirit of the 1960s trailer by choosing accessories with a retro feel. They decided to keep the trailer's original license plate and display it in the living room. There’s an electric mixer in the kitchen in a blue green color that projects a nostalgic vibe. With their Airstream mobile home, the Bowmans have visited a lot of interesting places. When they are not living in it, such as in winter, they continue to work on the van and improve it. The Idaho mountains provide an amazing backdrop for this postcard perfect photo of Primrose. This Rohini Velvet Daybed Cushion from Urban Outfitters makes this cozy corner so inviting for lounging all day or sleeping at night. The globe string lights add sparkle to the overall muted color scheme, with fresh touches of green provided by the natural potted and hanging indoor plants. The area rug with geometric patterns livens up this corner space. The woven baskets tucked under the daybed provide needed storage space as well as a decorative touch. A potted cactus plant on the floor adds to the relaxed vibe. The Marshall speaker rests on top of a small wooden round table while on the wall hangs Primrose's original license plate, a sentimental memento of its previous life. The framed drawing of Primrose by artist Kaari Selven perks up this nook while the salt lamp lights up the small space with a warm glow. It's the practical space saver: a rod to hang assorted mugs and pans. A single wooden shelf attached to the wall to carry knick-knacks completes the picture. Washable wallpaper would be a colorful and effective solution to brighten up the bare walls of this tiny kitchen area. A simple sink is all you need to keep things in this work area tidy and clean, and the view outside through the tiny window should be enough to keep you in good spirit while doing housekeeping chores. The rich ornate design on the red carpet provides a stark contrast to the clean lines of the crisp white bed cover in this intimate space. The random clutter next to the neatly made-up bed gives it a lived-in charm. Nothing suggests long sunny days better than laundry on a clothesline left hanging out to dry, no matter whether you live in a house with a big backyard or in a tiny mobile home. Who says you can't enjoy the outdoors when you live in a mobile home? On the contrary: You have all the space outside to serve as your front porch, where you can just sit and idle away the time. It should not come as a surprise that this pop-out window should be Elsa's favorite feature of Primrose. How cool is that? Don't let the size fool you. This little Airstream has everything you need.